Canaletto (Giovanni Antonio Canal) (1697–1768), St. Paul's Cathedral (detail) (c 1754), oil on canvas, 52.1 x 61.6 cm, Yale Center for British Art, New Haven, CT. Wikimedia Commons. Pure landscape paintings by specialist landscape artists were uncommon before about 1700 – those of the Dutch Golden Age, such as the master-pupil partnership of Jacob van Ruisdael and Meindert Hobbema, were among the exceptions. When the genre became established in the eighteenth century, it was largely due to the demand for ‘views’, and the success of painters such as Canaletto in meeting that demand. 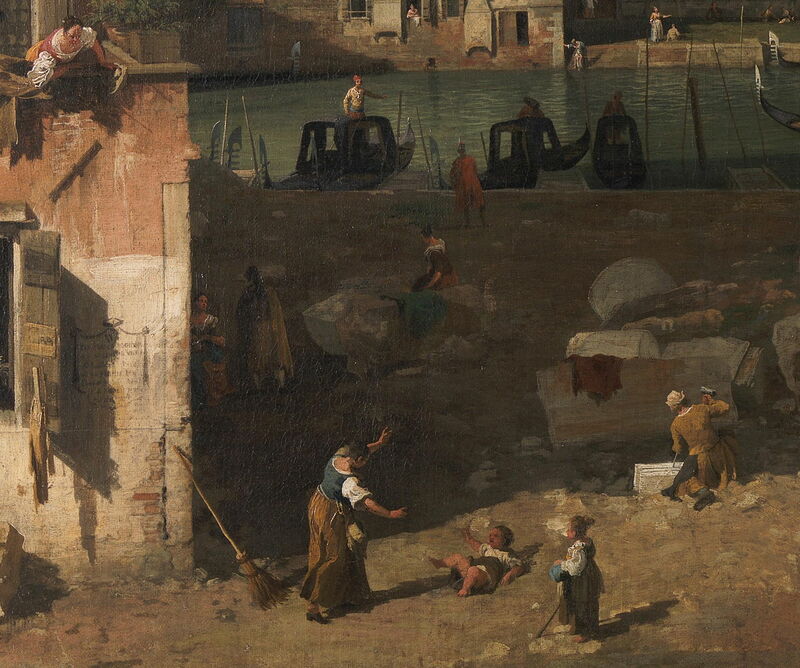 This article looks in detail at the figures painted by Canaletto (Giovanni Antonio Canal, 1697–1768) in a range of his landscape paintings, to consider their role. 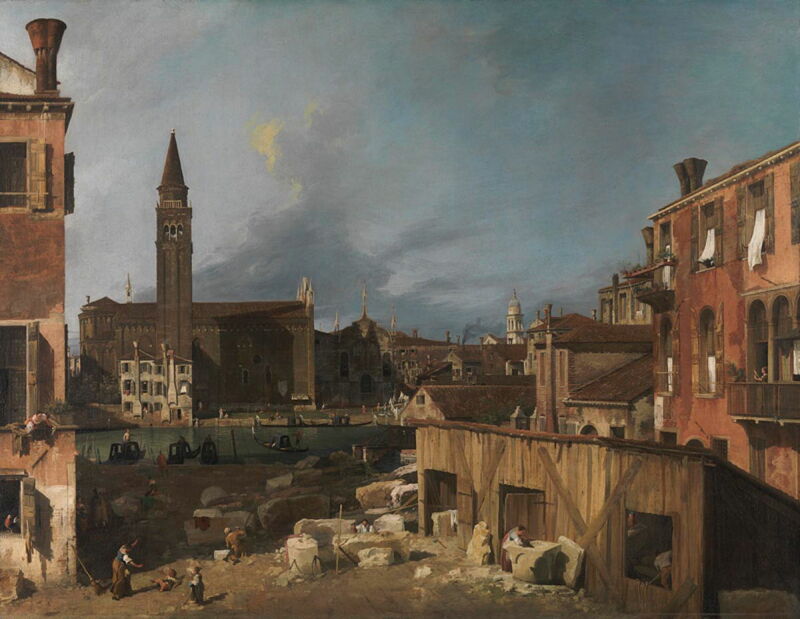 Widely known as The Stonemason’s Yard, and held to be among Canaletto’s finest paintings, his view of Campo S. Vidal and Santa Maria della Carità from about 1725 features fewer and larger figures than many of his later works. Most of its people are in the lower left corner, which is a hive of activity, as shown in the detail below. Canaletto (Giovanni Antonio Canal) (1697–1768), Campo S. Vidal and Santa Maria della Carità (‘The Stonemason’s Yard’) (detail) (c 1725), oil on canvas, 123.8 x 162.9 cm, The National Gallery (Sir George Beaumont Gift, 1823), London. Image courtesy of and © The National Gallery, London. At the top left corner of the detail, a woman leans out over a balcony as if calling to those below her. In the middle of the foreground, another woman, who has been sweeping with the broom behind her, raises her arms towards an infant, who appears to have fallen on their back and is now urinating. Another older child stands watching. Caught in the same patch of sunlight, on the right, a stonemason is working with hammer and chisel. Further back, in the shade, three other figures are talking or passing the time inactively. Behind them a man, his back to the viewer, is talking to three gondoliers who are stood in their boats. More distant figures are also seen scattered along the opposite bank of the canal. These figures populate the space without telling us anything specific about it or them. They give the image a realism by their everyday routine nature and activities. They are pure staffage. 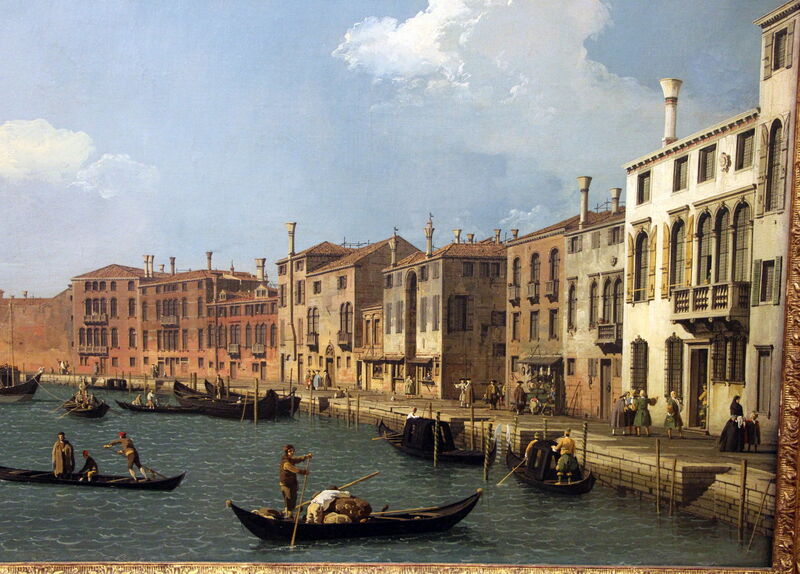 Canaletto (Giovanni Antonio Canal) (1697–1768), Canale di Santa Chiara, Venice (c 1730), oil, dimensions not known, Musée Cognacq-Jay, Paris. Image by Sailko, via Wikimedia Commons. This view of Canale di Santa Chiara, Venice from a few years later, probably around 1730, is more typical of Canaletto’s better views of Venice. There is a fairly even spread of figures along the pavement in front of the buildings, and they are dispersed among the gondolas on the canal. 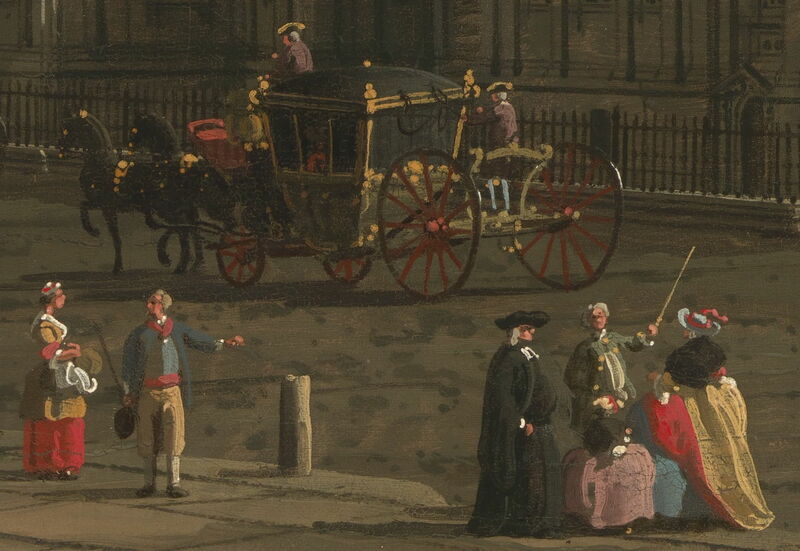 The detail below reveals them to be engaged in similar everyday routines: talking, walking, a man and child standing at a shop front. They’re all well dressed, but without distinction, apart from the gondoliers who wear typical costume for the job. 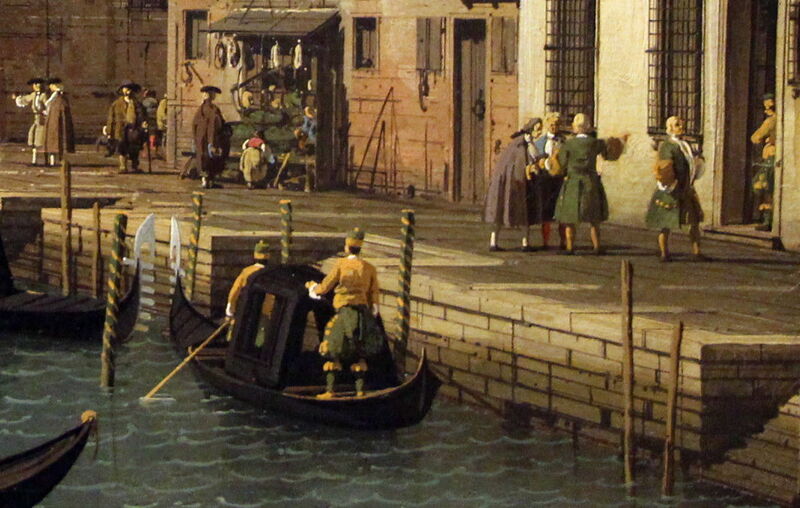 Canaletto (Giovanni Antonio Canal) (1697–1768), Canale di Santa Chiara, Venice (detail) (c 1730), oil, dimensions not known, Musée Cognacq-Jay, Paris. Image by Sailko, via Wikimedia Commons. Canaletto (Giovanni Antonio Canal) (1697–1768), Alnwick Castle (c 1750), oil on canvas, 139 × 113 cm, Private collection. Wikimedia Commons. 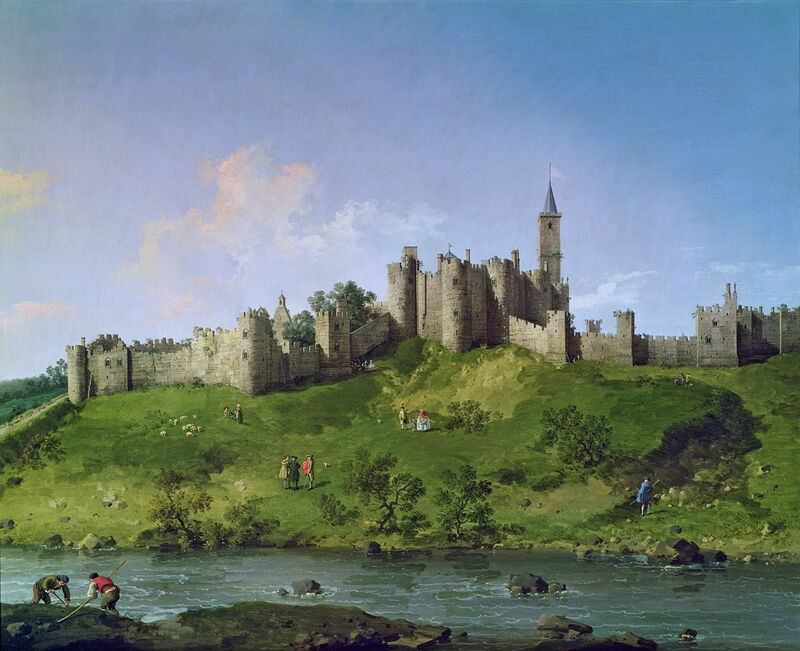 When he was in England, Canaletto painted some more rural views, including this fine view of Alnwick Castle in about 1750. Dotted fairly evenly across its very green grass are more figures, shown below in better detail. 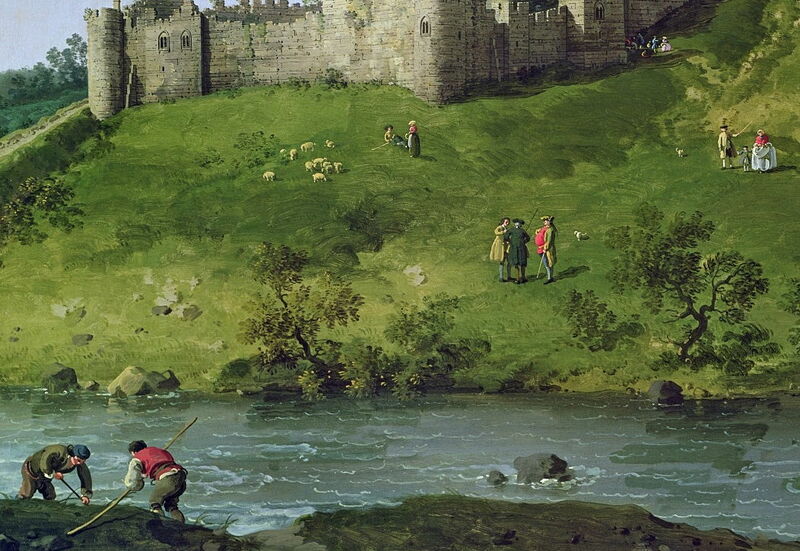 Canaletto (Giovanni Antonio Canal) (1697–1768), Alnwick Castle (detail) (c 1750), oil on canvas, 139 × 113 cm, Private collection. Wikimedia Commons. Only one group appears to be working at any real activity: the two men in the foreground, at the lower left corner, who appear to be using a crowbar on something in the riverbank. Canaletto does not afford us a clear view of what they are doing, though. Around the castle, there is a shepherd and companion with an unrealistically tiny flock of sheep, and three small groups of people talking, looking, or just present. These all seem remarkably everyday, even humdrum. 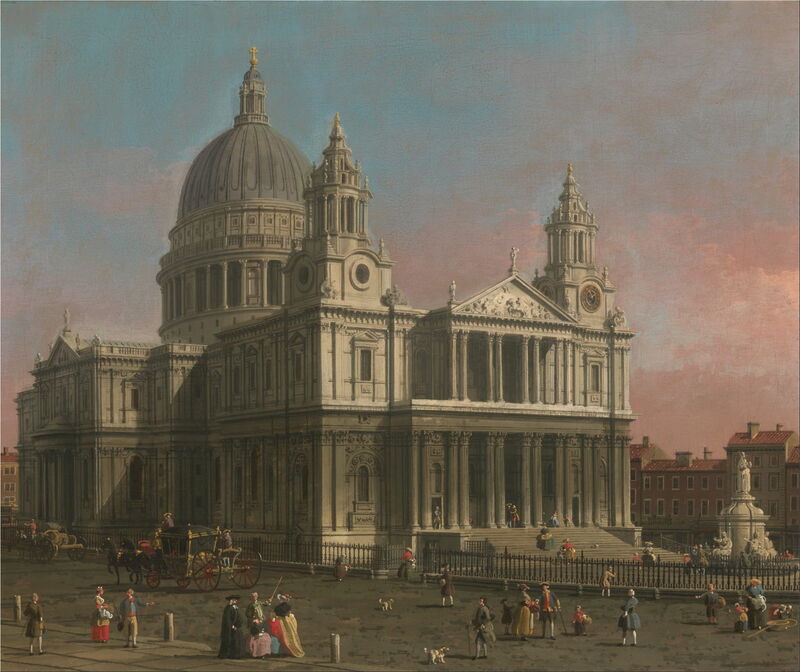 Canaletto (Giovanni Antonio Canal) (1697–1768), St. Paul’s Cathedral (c 1754), oil on canvas, 52.1 x 61.6 cm, Yale Center for British Art, New Haven, CT. Wikimedia Commons. This imposing view of St. Paul’s Cathedral from about 1754 shows a similar phenomenon in a thoroughly urban context: a fairly even scatter of small clusters of figures, none of which is doing anything out of the ordinary. Indeed, there is some degree of repetition: two small dogs echo one another, for example, and there is another man standing with his walking stick raised in the air, just as at Alnwick Castle. These gestures, shown more clearly in the detail below, are familiar, and everyday. Canaletto (Giovanni Antonio Canal) (1697–1768), St. Paul’s Cathedral (detail) (c 1754), oil on canvas, 52.1 x 61.6 cm, Yale Center for British Art, New Haven, CT. Wikimedia Commons. Canaletto (Giovanni Antonio Canal) (1697–1768), The Bucintoro at the Molo on Ascension Day (1759-61), oil, 583 x 1018 cm, Dulwich Picture Gallery, London. Wikimedia Commons. 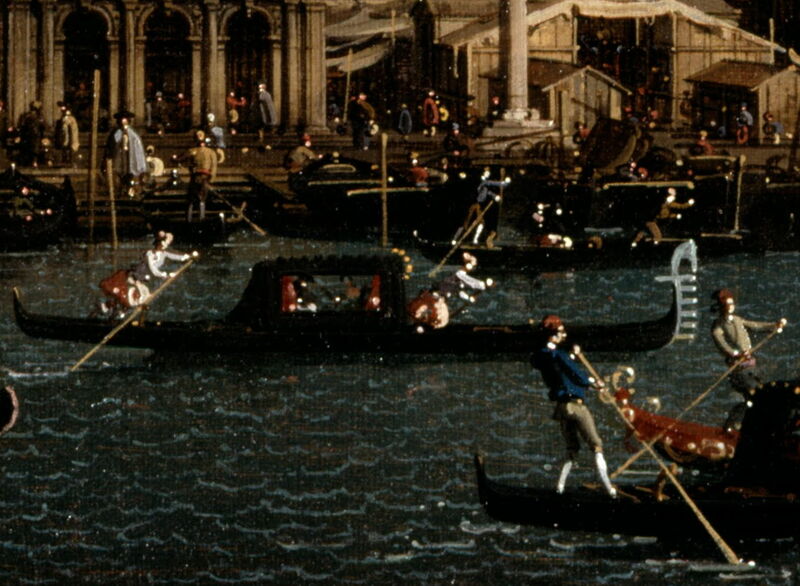 Some of Canaletto’s views feature crowds too. The Bucintoro at the Molo on Ascension Day (1759-61) is an example, with many packed vessels, and large numbers seen along the water’s edge. Although the quality of the detail image below is not ideal, it makes clear how they are simply going about their business, doing the everyday. Canaletto (Giovanni Antonio Canal) (1697–1768), The Bucintoro at the Molo on Ascension Day (detail) (1759-61), oil, 583 x 1018 cm, Dulwich Picture Gallery, London. Wikimedia Commons. Throughout his career painting views, whether of Venice or overseas, Canaletto populated those paintings with a fairly even spread of figures. They add colour and ‘human interest’, give the air of realism, and enhance the effects of perspective. But looking at them more carefully, they seem a little too even and consistently spread. 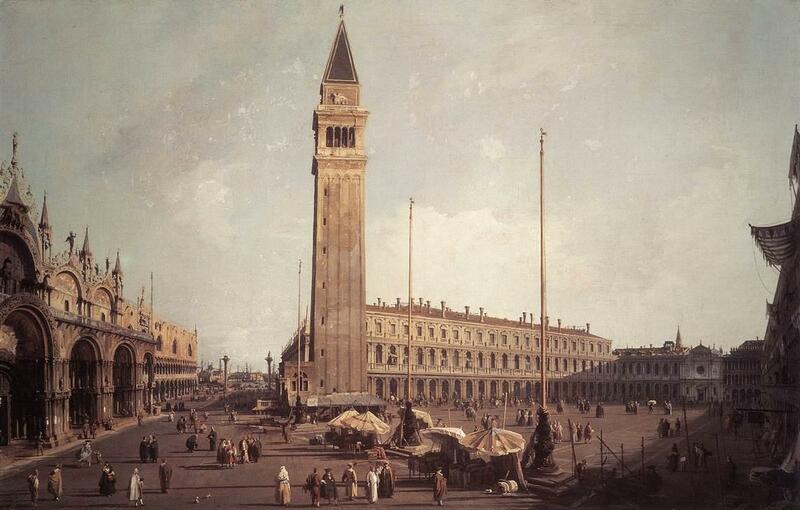 The following three views of Piazza San Marco painted over a period of almost forty years show how consistent is Canaletto’s staffage, again almost to the point of being repetitive. 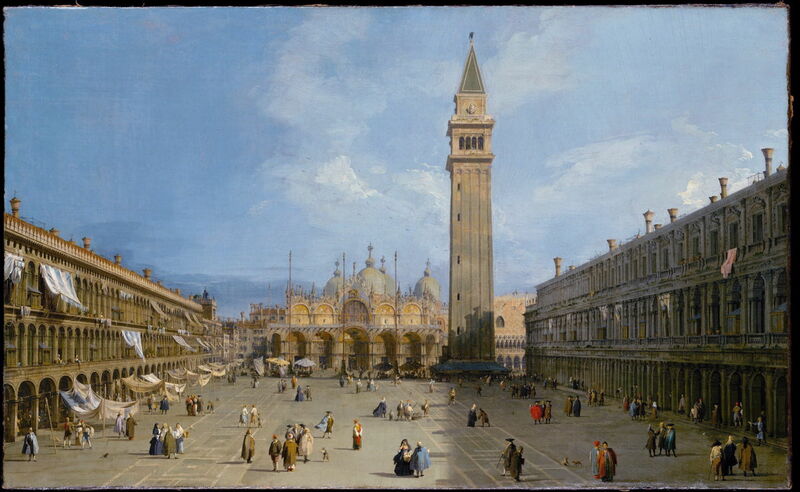 I am not suggesting that Canaletto invented staffage, but he was certainly one of its first major exponents. His figures adorn and enhance what he was really most interested in: the buildings, structures, and their details – the landscape or cityscape, not its inhabitants. Posted in General, Painting and tagged Canaletto, figures, Hobbema, landscape, painting, staffage, van Ruisdael, Venezia, Venice. Bookmark the permalink. This is the first post of yours that I have read through and it is delightful. (Plus, I’m saving all of the pictures.) Do you suspect , because of the haphazard scattering of the figures, that the artist was perhaps making a token gesture…possibly suggested or required by a patron or to make the pieces more appealing to buyers…or was he making a statement about people, and the difference in the ‘importance’ of the people of different classes. I’m thinking, specifically, of the laborers on the banks of the river (who were likely prying up rocks to clear the land) in contrast to the gentry who were standing about useless like cardboard cutouts…with no more relevance than the random sheep. 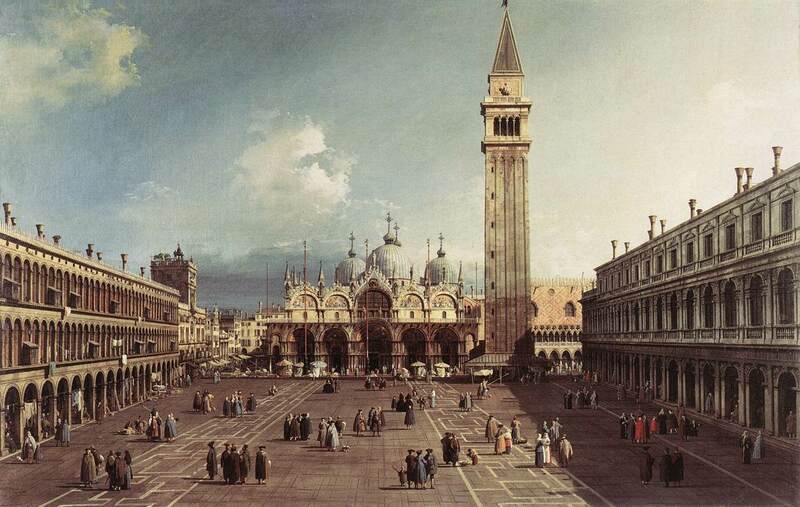 I am not aware of any evidence that Canaletto had any social ‘programme’ in his art. His figures are remarkably evenly distributed, and look to me to have been added for pure effect. I don’t think the he intended any message or meaning, but recognised that figures are an important part of many landscapes. 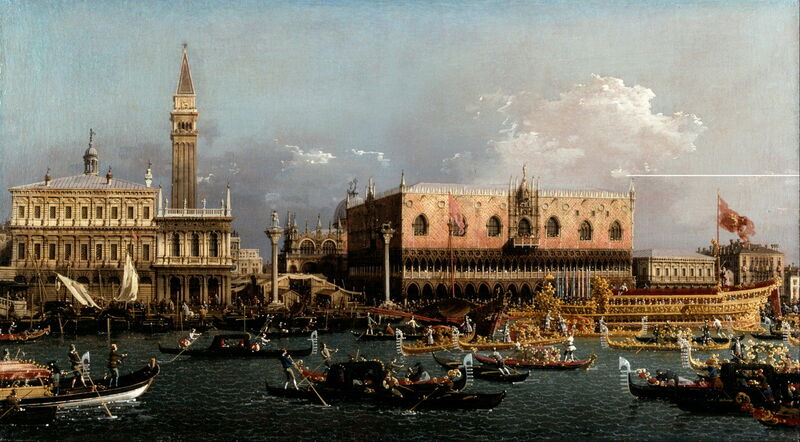 I think that Canaletto was rather more interested in the non-human landscape, and in making fine paintings. And he did. You are right about his fine paintings; as an artist myself, (well, a painter of pictures, anyway) I am blown away by the detail in the details coupled with the impact of the whole image. Thank you for your website. It’s my pleasure – as you may gather, I greatly enjoy writing the articles for it.